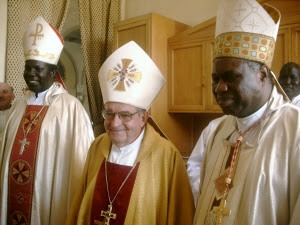 Bentiu, the capital of oil rich Unity State has for the first time celebrated the priestly ordination of Fr. Edward Joseph Deng Agoth. On the occasion to mark the solemnity of Christ the King, Bishop Vincent Mwojok Nyiker of Malakal catholic Diocese flew to consecrate Deacon Edward Deng to the order of priesthood according to Canon Law as required for transitional diaconate. The feast of Christ the King is celebrated worldwide in the catholic nations. It is a feast that ends the liturgical year before the beginning of Advent period which culminates with the nativity of the Lord Jesus. Bentiu town was in joyous mood for the last three days as Christians throughout the state assembled to honor their son who received ordination in the parish of Bentiu. It is also the first of its kind in the history of the Catholic Church in that diocese. Newly ordained Fr. Edward Joseph Deng hails from Pariang County, one of the nine counties of Unity state. "Thousands of faithful came from all over the state; Biemnom, Leer, Mayom Pariang etc." said Deacon Biong Kuol, Fr. Edward's colleague. Big thanksgiving party was organized at Bentiu Stadium where representatives of the counties staged traditional dances and presented gifts for Fr. Edward. Earlier on, Bishop Vincent was assisted by nine priests representing the dioceses of Khartoum and El-Obeid with Frs. Luigi Cignolini and Jervas from the Comboni Missionaries. Fr. Samuel Akoch and his fellow priests from Malakal diocese worked hard to crown the feast joyfully. The government of Unity state was represented in full force by the governor, Taban Deng, ministers, legislators, Sisterly Churches and Col. Mabek Lang Mading, the commissioner of Pariang County. H.L Vincent Mwojok will begin his pastoral visit to western Nuer areas on Monday 26th November 2007 to assess the spiritual situation of the Christians in his diocese after attainment of peace in 2005. His visit will take him to Biemnon, Leer, Mayom, Rubkona, and Pariang. When asked by NSV about his priestly ordination, Fr. Edward said; "I'm very happy because the occasion gave me courage which I see in the faces of my people who suffered during the war." On the feast itself Fr. Edward said; "the feast brought thousands of faithful together for the first time. I see here unity of our people, many tribes are represented here. We are truly universal church." “I want to help my people by preaching for them the word of God, to enlighten them about their common responsibility so that we reach true reconciliation and peace in this land." Bentiu Parish was opened in 1972 but remained inaccessible for long time during the last civil war. In the 1970s Fr. Zachariah Chatim (RIP), first Nuer Catholic priest worked hard to evangelize his people. Fr. John Mongi revived the parish years preceding CPA when warring parties in the area began to change allegiance. Fr. Edward Joseph Deng, 33, is a graduate of theology from St. Paul's Seminary, Khartoum. He holds B. Theology from Urbanian University. His first assignment will be determined by his Ordinary and his consulters in the next coming days.